Guests enjoying food and drinks in the Benedum Center grand foyer before the speakers begin. 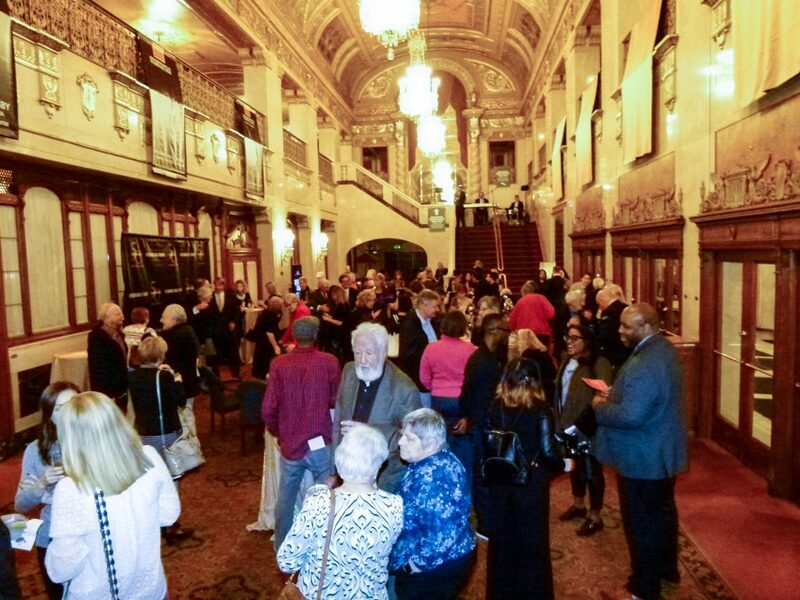 Pittsburgh Ballet Theatre announced its upcoming 50th anniversary season at a gala reveal event Thursday evening in the grand foyer of Benedum Center, with major donors and subscribers, board members, and other special guests in attendance. PBT Executive Director Harris N. Ferris gave the opening remarks and welcomed the guests and dignitaries. 50th Anniversary Chair Carol Byham spoke about how her first exposure to the ballet was on an early date in New York City with her now longtime husband, Bill Byham. 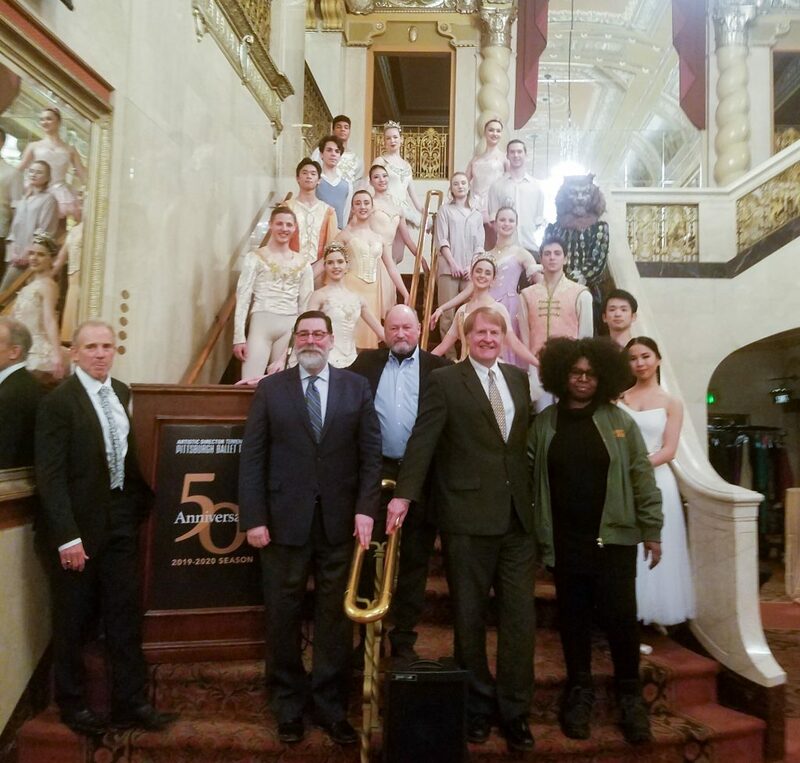 Allegheny County Executive Rich Fitzgerald and Pittsburgh Mayor Bill Peduto congratulated Pittsburgh Ballet Theatre on reaching its 50th anniversary, and spoke of what the ballet and arts mean to Pittsburgh. Then it was time for PBT’s noted Artistic Director, Terrence S. Orr, to introduce each new production. Orr recounted with fondness his 23 seasons (counting the new season) as artistic director. He also thanked composer and ballet conductor Chris Christensen, whose father Lew Christensen directed the legendary San Francisco Ballet for many years and choreographed Beauty and the Beast, which will be performed in PBT’s new season. Other productions coming in 2019-20 are a revival of the 1800s classic Giselle, The Nutcracker, and two programs of modern works. PBT is partnering with the August Wilson Cultural Center to present Here and Now, which will include ballets by three contemporary African-American choreographers: Pittsburgh native Kyle Abraham, Pittsburgher Staycee Pearl of PearlArts Studios (just named an artist in residence at PBT), and Dwight Rhoden of New York’s Complexions Contemporary Ballet. The final production of the season will be Balanchine and Tchaikovsky. PBT Artistic Director Terrence S. Orr, center is flanked on the left by Pittsburgh Mayor Bill Peduto and PBT Executive Director Harris N. Ferris; and on the right by Allegheny County Executive Rich Fitzgerald and Artist in Residence Staycee Pearl. PBT dancers are behind them. The presentation of the 2019-20 season was memorable in itself. As Orr announced each production, a male and female dancer, dressed in beautiful costumes of the ballet, descended the grand staircase of the Benedum and a banner of the production was unveiled from the second-floor balcony railing. The performance was sublime, with the talented PBT dancers expressing the revelry and excesses of the Roaring Twenties as they combined classical ballet moves with an occasional, purposeful contemporary edge. The period costumes and sets, by Carl Farmer, were, to use an old-time phrase, quite swell. An added bonus, as always, was the PBT Orchestra, which played the good-time jazz music of the period to perfection. The original score by composer Carl Davis is almost like a cinematic soundtrack. 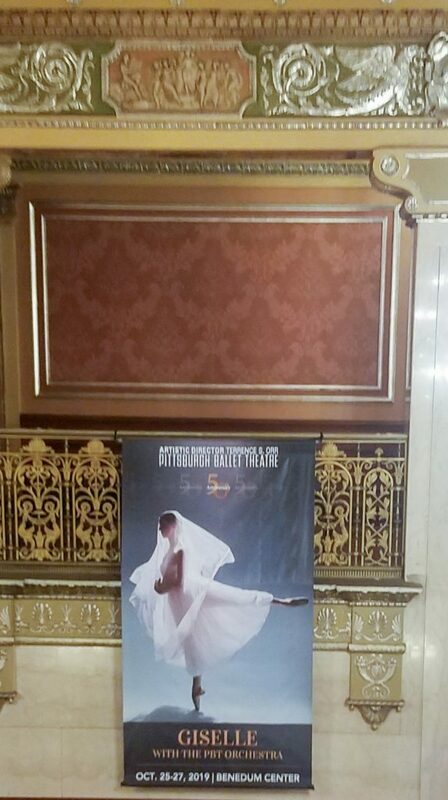 A banner for ‘Giselle,’ the first play in the 2019-20 season, hangs from the balcony railing after it’s unveiling. Attendees of the reveal event enjoyed champagne and drinks accompanied by a delicious assortment of hors d’oeuvres, chicken sliders, lamb-burger sliders, salads, and fresh fruit and cheeses. The Duquesne Club catered the event, providing top-notch food and service. Pittsburgh Ballet Theatre performs The Great Gatsby at the Benedum Center February 8 – 17. For tickets and more information see the PBT website or call the box office at (412) 456-6666. Story and photos by Rick Handler. Performance photo courtesy of PBT and Duane Rieder. 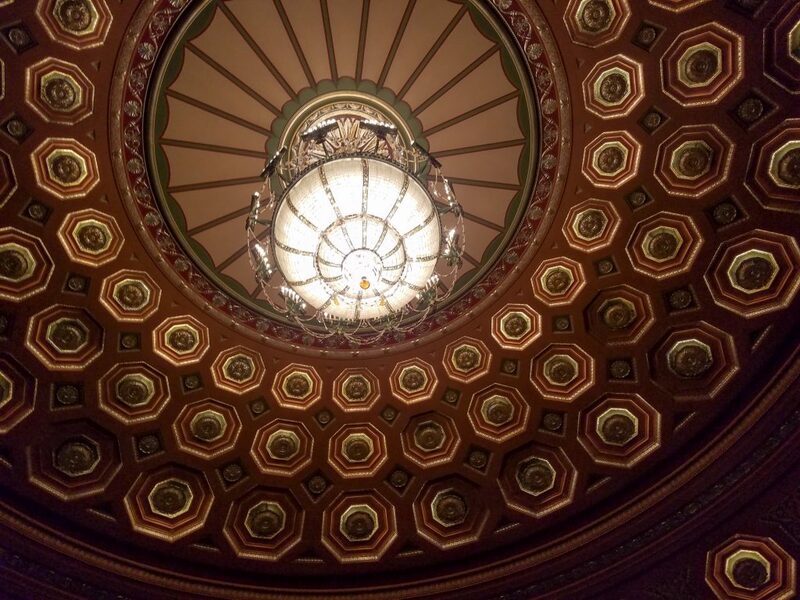 The ceiling chandelier of the Benedum Center.